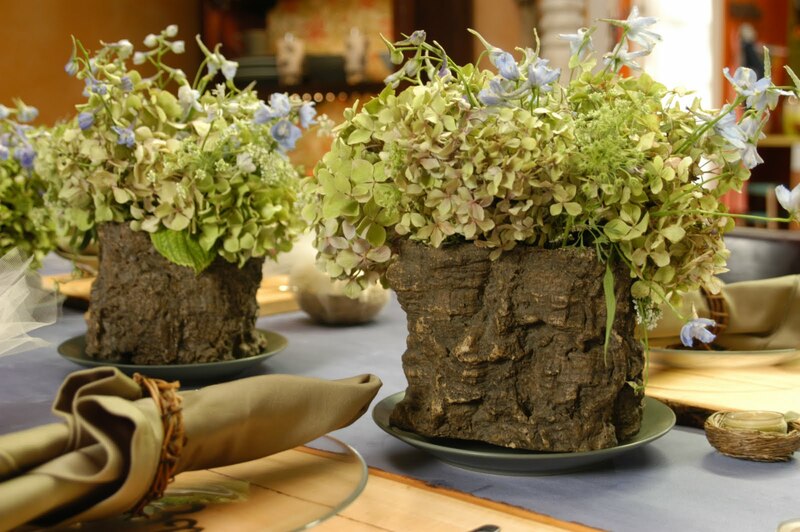 Create a floral centerpiece that lends an elegant touch to a rustic container. For this arrangement a cork and plastic pot made to look like tree trunk was perfect for the rustic elegance vibe. 1. Cut the floral foam to fit in the floral container. 2. Soak the floral foam in a sink or bucket until it is saturated. 20 minutes should be good. 3. Place the floral foam in the container. 4. Cut the hydrangeas so that they extend just higher than the containers. Sink the stems into the foam. Add delphiniums and Queen Anne's lace to finish the arrangement. Where did you buy the rustic container?